A little over a year ago we had in our shelter this giant Belgian Tervuren by the name of “Molly.” If you have ever seen one you would know they are a magnificent looking breed and very bright (for a dog that is anyway). Molly has apparently been doing very well in her forever home and her family has enjoyed her so much that they decided they wanted to get another dog. So here they were, once again in our shelter to adopt another dog. This pleased me very much of course. 🙂 They ended up adopting “Shamar” who is a little yellow American Eskimo mix. He seemed a bit unsettled about the transition and his new sister, but I’m sure in no time at all they will be a bonded pack. One of our rats was adopted, which doesn’t happen very often. I couldn’t tell if it was “Popcorn” or “Peanut.” No offense to any of you rats out there, but I often get them confused. Beady eyes, long tail, and whiskers and all… And oh! This huge rabbit was brought in from the South Lake Tahoe shelter. I totally mistook her for a cat at first because she was SO unbelievable big for a rabbit! She was 8 pounds and she was just spayed this week. I think this was the biggest rabbit I have ever seen! Siesta, the black and white one year old kitty was finally adopted. Hurray! She was an interesting cat too because she actually loved dogs and would always play in her water just so she could escape when her cage was being clean! Can’t say that I blame her about wanting to come out of her cage and I must say “quite ingenious” of her. 😉 But the whole idea of a cat loving dogs just isn’t natural. Truthfully I tolerate them, but that’s as far as I go. Oh well, no cat is perfect (except me of course) and around here we loved her despite the fact she had these unusually strange feelings towards dogs. I’m just happy she found her forever home. The kittens that were rescued and found in a box outside a dentist’s office a while back were all fortunately adopted. Their names were Garbanzo, Tortellini and Nugget. They were cute as can be and now live safely in their new forever homes. ~ Two other kittens, “Brownie” and “Fuzzy-Lilly” were also adopted along with “Milo” the one-year old Tabby who was here for less than a week. As for our dogs… “Byron” the smiley big yellow Labrador mix was adopted. I don’t think he ever stopped smiling. ~ “Kyrek” the silver husky/malamute/shepherd mix and “Meela” the five-month old brindle Pitbull puppy were also adopted. And finally, “Dizzy” the energetic Jack Russell Terrier was adopted! *Meow-zah! * I was so glad to see that she was adopted. Dizzy was staying with her foster family and then they decided just to keep her! She doesn’t even have to go through another transition. How cat-cool is that?! “Mongo” a beautiful black lab mix was adopted into a nice home where he will be playing with another lab that is supposedly just like him, only yellow. I think that’s totally cat-cool! Hmmm…makes me wonder it there is another “Bullet” like me on black instead of white? Anyway, “Grampie” this very handsome, slightly older cat with gorgeous blue eyes finally went home with a very caring gentleman. I’m quite pleased about that because there is only so much room in the shelter for older, handsome cats like myself! And besides, Gramps is ten years old. He has a history of being a little cranky with other kitties he’s had to live with. In his new home he’ll have his new owner all to himself! Tuesdays around here are of course when the vet performs surgeries to spay and neuter our animals. Things went purrfectly smooth as usual. The surgeries included seven kitties and four doggies. That means they will all be up for adoption tomorrow. Woo-hoo! 🙂 I wish everything in life could be that smooth and easy, but unfortunately that’s not always the case. 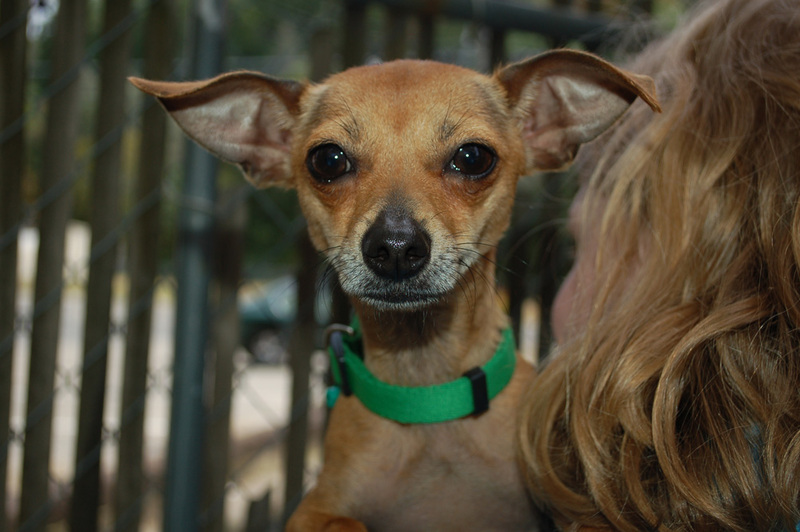 “Breezy” a little Chihuahua mix who came into our shelter was extremely shy and always frightened of everything. She was on the verge of completely shutting down. I honestly wasn’t too optimistic about her snapping out of it and I consider myself to be an optimistic cat. She was fearful of our staff the first few days here and didn’t warm up at all to any of the volunteers that attempted to make friends with her. Seeing pets in this state of mind break my feline heart, but I still kept my paws crossed for her. Finally, it was decided to try and put her in a kennel with the slightly shy “Pugface” (Chihuahua/Pug mix). And lo and behold! We began to see a spark in Breezy’s eyes and a quick wag in her tail! That little darlin’ came out of her shell! Her new found friendship perked her up and pulled her out of depression! And with her true personality shining through, she managed to find herself someone wanting to adopt her! Meow-zah!! Her new adopter spent lots of time with her in one of the outside dog runs. The two of them began to bond, getting to know each other more and Breezy’s little heart seemed to grow big! It was an amazing sight to see! *sniffles* They had so much fun playing together and Breezy even played in the WATER! A Chihuahua playing in the water? Who would have known a little Chihuahua would love to swim? My heart melted and I was so relieved that I kept my paws crossed for her! *more sniffles* Being here can occasionally be heart-breaking, but moments like today can also be so fulfilling. Especially when I see staff and others who don’t give up on an animal. They discovered a different approach to help Breezy and it made a difference in her. It makes me proud to be a part of this staff and the many volunteers that come out to help. So today we had four cute black, black and white, Lab/Pit Bull puppies surrendered to our shelter. I have a feeling these cute little guys will get adopted pretty quick. They are only nine weeks old, sweet, mostly calm and just plain adorable! We have a red, male Lab with a microchip come in, but unfortunately the chip can’t be traced back to the owner. I wonder if the owner just forgot to register their information? He came from Poor Red’s in El Dorado. ~ We also had two Border Collie/Aussie mix dogs come in. One male and one female. They were found on Hwy. 49 and Gold Hill. You should see them now…*giggles*…both are shaved. In time their hair will grow back, but I have to admit I found it a little humorous to see them after the shaving took place. ~ A nice-looking Shepherd/Husky was brought in from Somerset. Very beautiful creature for dog…almost kind of wolf-like in appearance. ~ And a tan-colored Chihuahua. And as far as adoptions, we had three kittens get adopted. The kitties Starbuck, Lola, and Mickey all went to a good home! Hurray! Last Thursday two dogs, “Trixie” the cattle dog and “Domino” the beefy Queensland were happily reunited with their owners. Hurray! Then on Friday, “Bella” the Schnauzer went home and “Boomer” the Border Collie was picked up injured…poor guy. BUT! Because Boomer’s owners filled out a lost report with our shelter as soon as he went missing, our staff were able to contact his owners right away! I so love our staff and what they do. True heroes in the eyes of my animal friends! Saturday we had “Rider” the Pit Bull go home and on Monday, “Cash” the Malamute went to his new home. And for the next morsel of information I shall do the kitty-jig!! — Cat roll PLEASE!! We have adopted ALL of our available kittens! Woo-hoo! We will have some more coming up soon, but I think this is awesome! Ahhh…flowers. I like to chew on their leaves and petals, but living in the shelter doesn’t give me the opportunity to get access to them. I suppose that’s for the best since I don’t always know which ones are ‘okay’ for me to chew on and which ones might be harmful. The only reason I was thinking about flowers was because “Lilly” the Schnauzer got adopted. Her name made me think of the Lily flower. I know… I know…Lillies are very poisonous to us cats, but hey, it wasn’t my idea to name her Lilly. 😛 Anyway, “Ginger” the Schnoodle was also adopted. Ginger and Lilly both came to our shelter together because their original owner passed away and that’s how they ended up here. I’m very pleased that the two of them both found a new forever homes even if that meant they couldn’t be together! Remember “Happy” the Shih Tzu I mentioned a couple weeks ago? The one that badly needed a bath after coming from a breeder where he spent all his first life in an outdoor pen? Well, he finally got adopted too! 🙂 I’m so glad that keeping my paws crossed helped him find a forever home! “Porter” the Corgi/Chihuahua, “Penny” the shy Border Collie, “Vienna” the overfed Dachshund, and “Bella” the Pit Bull all got adopted!! I am a very happy kitty today!! Boy I had to work especially hard today! I ended up having to cat-test a couple of dogs that passed my exam. Fortunately neither one of them wanted to try to eat me!! Another day another morsel of food, right? Someone has gotta do it even if it is tough work!! ~ I also found myself doing the cat-jig today!! Why do you ask? Because “Gus” the big, black lovable lab was finally adopted! “Meow-zah! !” “Noetoe” was adopted yesterday, but returned today because he was a little too clingy for the family and didn’t really like their other dog. Did you know that if you’re interested in adopting a second dog that you could bring your first dog into the shelter for a meet and greet with a potential adoptee? It’s always a good idea to do that before you adopt to help increase the chances of finding a good match. 🙂 “Bonnie” the Chihuahua was adopted today too and two scruffy little Schnauzer-mix doggies thankfully got baths! They will be going up for adoption shortly. The little dog “Cherry” was returned because her owner got a job. She was originally adopted from us some time the end of last year. I’m keeping all my paws crossed that we find a good match for her. “Sorbet” the cat was returned because her owner passed away. This always makes me feel sad. 😦 She was very happy and really loved her owner who adopted her a couple of years ago. I’ll keep my paws crossed for her too that she finds a new home that will provide her the love that she has been given the last few years. On a more positive meow, I’ve been watching lots of volunteers here spending a lot of time and energy helping out our staff. It’s totally cat-cool of them. I’m not sure what our staff would do without them. They deserve a purrrfect paw of applause. Meow!! So thank you volunteers! !